The weather here today was supposed to be rainy all day, so I had planned inside activities to do. Then it was gorgeous, sunny and breezy and not too warm, so around 17:30, I decided to take the dogs and my socks out for a trek. We didn’t go on a “real” hike, but we did go to Upton Hill Regional Park, which is a park with wooded trails that is walking distance from our house. Both dogs seem to enjoy walking there. We tend to go on walks long enough to wear Boris out, and short enough to just whet Ginger’s walking appetite! Today, we paused on one of the trails to take a shot of my Trekking XXL 76 socks on the trail. This is my first time working two socks at once on one circular. So far, so good. This is also my first time knitting with Trekking XXL — I always thought it was rough in the skein so I never bought any. Now that I’ve worked two short row toes and a few rows beyond, I’ve discovered that when worked up, it really is fantastic! I hope everyone else is enjoying their Trekking! Love the colorway, the scenery, and the dog! Best wishes Trekking! 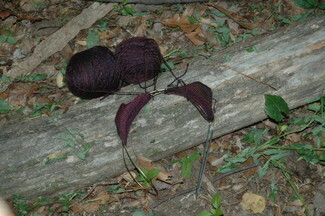 We have had nothing but rain, and any outdoor adventuring with knitting will have to wait until Monday, or so it seems. 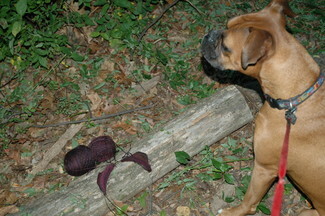 Glad you like the yarn so far!! It’s great that you got out. Your colorway is fab! great color. i had my eye on that one… any hike, anywhere… as long as the socks are coming with ya’. When my mom sees me knitting socks and the toes are at the point you are at, she always asks me, “Is that my bikini? Let me know when you are ready for me to try it on.” She never gets tired of the joke, even though I do. Looks like you all had a very nice Trek!